Ric Nadel Escapes from Alcatraz – Triathlon-style! 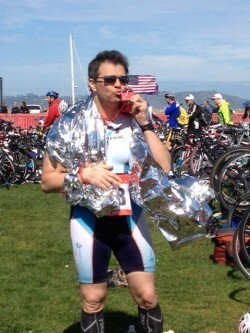 Ice Air co-CEO, Ric Nadel, completed the Escape from Alcatraz triathlon in San Francisco, CA. After diving into 50-degree water in the San Francisco Bay, swimming 1.5 miles, biking for 18 miles and running for 8 miles, his final time of completion was 3 hrs and 53 minutes. Quite a feat! Mo Siegel and Ric Nadel Escape Alcatraz…Again!